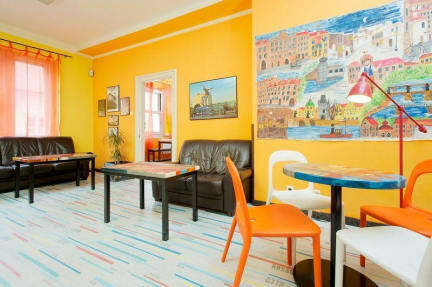 Old Prague Hostel is one of the few hostels located right in historical centre of Prague! 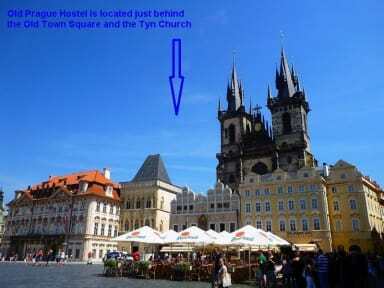 We are cheap accommodation in the Old Town next to the Old Town Square and the Astronomical Clock. Why spend money for public transport or taxi?! You can go from a club/bar directly to your bed - no taxi needed! 2014, 2015, 2016 Hostelworld Hoscar winner - Most Popular Hostel in Prague! Hostelworld.com customers have made us a top-rated hostel in 2008 and 2009. We have also been recommended by Le Guide Michelin - Green Guides, Rick Steve's Guide, Let's Go and USA Today Travel and we received the Tripadvisor Certificate of Excellence for 2010 and 2013. The pub crawl picks up at our hostel every night. We have rooms and dormitories with two-to-eight beds as well as a suite for up to five guests with a private bath. Nice designed hostel in the former living building with an elevator. Humble but good breakfust( reception gives out a sandwich every morning. Kust ask them). Every room closes with its own key, also there is a big locker for ur stuff so that u can put the whole luggage inside, but my lock was not strong and a door of someone else locker was brocken... A pity that there is no any shelf in the bathroom and shower is fixed up on the wall ( so if u want to wash...wash urself completely:). Завтрак хлопья, молоко, чай, кофе. For 15 euro thats ok. You got bed and a small breakfast and probably you meet someone in common space.But If you want to spend really great time in hostel, pick another one. Drawbacks; 1. Low wifi connection even in common space (in room thats almost none) 2. Small Common spaces on each floor, so there is a little chance to meet people from another floor. 3. Breakfast; poor sandwich, juce, tea, coffee. 4. You cant use your own padlock for locker. That worth 15 Euro, not more!